Rier Plate Anglers is leading an international effort in the implementation of Learning-At-A Distance (LaD), High School level, four years, in four communities in the States of the Amazon and Roraima in Brazil who practice subsistence and commercial hunting in three water basins, Jufari, Xeriuni and Amajau rivers, over a total area of 7,085,000 acres (See red circle in map below). To halt and police commercial hunting (poaching) of all species. To voluntarily stop all subsistence hunting of the endangered species listed below. To voluntarily regulate subsistence hunting for non-endangered species in areas where off take is allowed, thereby insuring that the off take is sustainable. Born and raised in South America, Luis Brown, age 64, was educated in the US at the Wharton School of Finance. He was owner and CEO of paper, pulp, lumber, and cattle operations until the early 90s. Currently, he devotes most of his time to outdoors avocations through his company, River Plate Outfitters, and to various socio-environmental projects in the Brazilian Amazon Rainforest through another company, River Plate Anglers (RPA). RPA has been a pioneer in Peacock Bass sport fishing since 1992. In 2004, RPA initiated a major conservancy project designed to persuade locals to curtail commercial fishing in RPA’s catch-and-release sportfishing areas. This ensured that RPA’s client anglers would enjoy the finest Peacock Bass fishing experience in the Amazon. 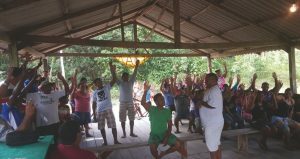 In return for this concession by locals, River Plate Anglers has made many very large humanitarian financial commitments to the rainforest communities. Over the years, these financial commitments have evolved into Community Based Natural Resource Management (CBNRMs) Programs on 16 million acres of rainforest water basins extending outward from the City of Manaus in a 1,000-mile-diameter semi-circle. These programs benefit more than 1,000 families. This is the epicenter of the Peacock Bass recreational fishing industry where River Plate Anglers operates five luxury mobile safari camps. Government expenditures in the areas where RPA operates are not helping fund conservation programs that protect endangered species. In fact, only a very small portion of the operating budget in the Amazon is allocated for conservation at the Federal level (IBAMA) or the state level (IPAAM). Almost no money is trickling down to the community level. More problematic, even if conservation funds did get down to the community level, it is unlikely that federal or state authorities could adequately police conservation efforts in and around small, scattered communities in remote parts of the Amazon rainforest. Only motivated individuals in communities can police local conservation efforts in an area such as the Amazon. Only they can save mammals from extinction and protect their habitat. That is why CBNRMs, such as those created by RPA, are so important. RPA has pushed hard to implement successful stewardship initiatives that put communities in charge of their local resources. Utilizing the CBNRM structure, RPA has persuaded communities to ban all commercial fishing and almost all lumbering, and it has helped reduce the amount of high-negative-impact farming taking place in a number of water basins. Curtailing these activities has reduced the amount of damage being done to the entire ecological chain, thus helping conserve a number of important wildlife mammals, including some under threat of extinction, such as the Brazilian Tapir (Tapirus), the Amazonian Manatee (Trichechus) Inunguis, the Anteater (Vermilingua), the Marsh Deer (BlastocerusDichotomus), the Spider Monkey (Ateles), and the Sloth (Folivora). To be sure, despite our efforts, commercial poaching and unregulated subsistence hunting continues to take its toll in some areas. Some of the mammals mentioned above play a crucial role in spreading seeds over the forest. That role has taken on added importance with the increasing prevalence of drought and fire. The latest El Niño caused an increase in drought and fire in 2015/2016 that was 500 percent higher than the historic average. 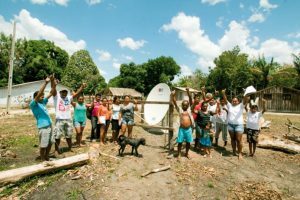 The planned investment would maintain our pilot LaD High School program (learning center and satellite system) in one (Caicobi) of our four communities and expand it to the other three, with a total socio-environmental reach of six communities and a total of 350 families. Project completion would take four months, including the time it would take to gain the communities’ full approval and understanding of the project and its conservation obligations. All projects would involve a “bottom–up” voting policy. A methodical “bottom- up” electorate approach to all decision-making. Conservation is all about “buy-in” from the people who live side by side with nature. To encourage a sense of “proprietorship,” RPA has implemented a recreational fishing revenue-sharing system. The LaD High School project itself further reinforces “proprietorship.” Importantly, the LaD High School project helps prevent urban migration of adolescents, which prevents family break-up and urban sub-employment which commonly leads to involvement in drugs and prostitution. Conservation is all about involving everyone economically, not just community leaders, so RPA has augmented its revenue-sharing system with a revenue inclusion policy that seeks to involve all families within a community in the conservancy effort. The revenues are applied in training the locals for sport fishing and ecotourism endeavors and in training for local production of food supplies. Currently, RPA is paying up to 200 percent above market prices for food supplies the communities provide RPA. In certain water basins up to 80 percent of all families have at least one family member working in the RPA revenue sharing system. This three-pillar approach has met with remarkable success in our communities. But, we could be even more successful if we could maintain our current pilot LaD High-School on the Jufari water basin and further extend it to the Xeurini and Amajau water basins in reciprocity for the conservancy of wild mammals in danger of extinction. Communities are well aware what it means to a tourist to witness these fascinating rare animals in the wild and how their presence in the forest will favorably impact the demand for their water basin and their respective revenue–sharing system. Continue to reinforce “buy in” and “proprietorship” concepts and maximize our revenue inclusion policy of all families by further promoting sustainable extractive activities and cottage industries such as exotic tropical fruit processing, art craft, fishing lures, etc., as well as organic vegetable gardens and various technical skills demanded by the sport fishing and eco-tourism industry, even at subsidized above-market prices. Approximate execution timing. By 2019 these steps should insure that 80 percent of all families should have at least one family member who benefits from our CBNRM . To obtain the funding for field studies and monitoring needed to optimize our sustainable use management plan for subsistence hunting of non-endangered species. Subsistence hunting, although prohibited by law, is widely practiced by all stakeholders in these remote areas as a source of protein. It is practiced even in most preservation areas. Approximate execution timing: 2016-2017. The economic value of conservation has to outweigh the economic value of current destructive practices in the Amazon if real progress is to be made. This truth is borne out by the way the Xeurini community (Terra Preta) voted in September 2015 (see photograph below) to ban all subsistence fishing for Peacock Bass. Provided the proper incentives, we are confident the communities we work with will vote for the immediate banning of subsistence hunting of endangered species, for the policing of all commercial poaching and for the enlightened regulation of subsistence hunting. 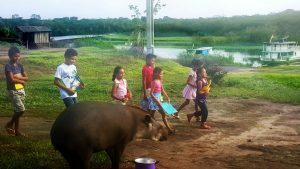 If the families in the Xeurini community voted to stop fishing for Peacock Bass, their main source of protein, they will also stop harvesting Tapir, Manatee, Anteater, Marsh Deer, Spider Monkey and the Sloth! The RPA CBNRM sustainability model has been proven a success. Consolidating and expanding it in the communities we work with could have an enormous impact on several pristine water basins in the Amazon and perhaps provide a model for programs elsewhere.